To say this has been a challenging crop production season is an understatement, and some parts of the state understand this more than others. The limitations of field working days due to wet fields and high wind and temperature continues to limit corn and soybean weed management practices. As we enter July, safe and effective weed management practices begin to diminish rapidly. In general, the biggest limiting factors to consider are weed size and density, and crop canopy height and days to row closure. All postemergence herbicide labels target 4-inch weeds or less and current weed height will be a function of crop planting date, weed species, date of weed emergence and effectiveness of preemergence herbicides. Weed control scenarios with a low likelihood of successful postemergence outcomes would involve early-emerging weeds that emerged right after planting; giant ragweed is a good example. Weed densities and size will be too large for adequate control with an herbicide. Weedy fields where you can target one or two weed species are more likely to result in a positive outcome. Dense weed populations and fields with a mixture of weed species are more challenging due to the difficulty in getting adequate herbicide contact on the weeds and finding an herbicide mixture that does not enhance crop injury. Crop canopy height is another limiting factor to consider because access to the crop canopy and contact with the weedy understory will be limited. As we enter July, both corn and soybean will transition into their reproductive stages. This is a critical point for systemic herbicides such as the plant growth regulators (e.g. dicamba and 2,4-D), glyphosate and ALS herbicides (e.g. Capreno). Systemic herbicides can move from the point of contact to the areas of reproductive development, not a good thing! Two factors that are often overlooked due to the focus on this season's weed control is the impact of late-season herbicide applications on carryover to next year’s crop rotation and preharvest intervals that are in place to prevent herbicides from reaching unacceptable levels in seed and crop residue. Again, let me refer you to the June 18th Crop News Blog. With current moisture and temperature conditions, crop growth will rapidly move out of labeled growth stage parameters. Postemergence corn herbicide labels recommend transitioning to drop nozzles to achieve better weed contact and reduce crop injury potential, extending the application window. Examples would include, Callisto (30 inches or V8), Laudis (V9), Impact (up to 48 inches), Liberty (V7 or 24-36 inches) and Capreno (V7). The challenge with drop nozzles is keeping the herbicide out of the corn whorl. Hence, wide booms on uneven ground are often trouble. Tall waterhemp thrives under hot and wet conditions and open soybean canopies that are slow to close due to wet weather, iron chlorosis, soybean cyst nematodes or other factors are likely to experience multiple weed flushes into July. Due to the common occurrence of glyphosate-resistant biotypes, the once easy glyphosate option has been diminished. At this time in the growing season many people are faced with the choice of which postemergence herbicide option to use for emerged tall waterhemp. Most of this week’s questions have been focused on the Group 14 (PPO inhibitor herbicides). Please read the June 18th Crop News Blog for more details regarding other options. The primary Group 14 herbicides are fomesafen (e.g. Flexstar), aciflurofen (e.g. Ultra Blazer) and lactofen (e.g. Cobra). There are trade-offs to be made when selecting a Group 14 herbicide. In general terms, I rank the crop injury potential to soybean from least injury to most injury in the order presented at the beginning of this paragraph. However, for fomesafen, as you move into July, the risk of carryover to next year’s corn crop increases. There are many factors that influence the likelihood of fomesafen carryover but I have been receiving more carryover reports this year than in years past so I feel it is an emerging issue. Group 14 herbicides are contact herbicides that will defoliate portions of the crop canopy. Injury to soybean stands already under stress will set the crop canopy development back and leave the field open to later tall waterhemp flushes. The Cobra label refers to the disease suppression potential of white mold and Sudden Death Syndrome caused by two different species of fungi. The label indicated that the application must be applied prior to infection and before soybeans are past R2. In my experience and based on the large amount of data that I have seen in past years I would like to caution you that results from this use of Cobra have been quite variable in protecting yield. I would suggest that you keep your focus on weed control not disease management with this herbicide. Layering a Group 15 preemergence herbicide at this time of the year has proven effective in extending the duration of tall waterhemp control. This allows more weed-free time for the soybean canopy to close, which will in turn provide a good level of free weed control. Group 15 herbicides such as Dual, Outlook, Warrant, or Zidua with either of the broad-spectrum herbicides, glyphosate or glufosinate that your seed technology allows have been the standard practice. 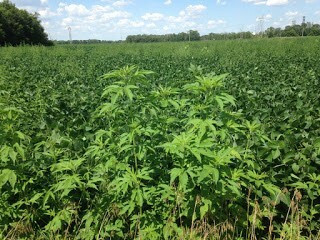 The article, Got waterhemp? Layer residual herbicides to maintain control describes this layering strategy in more detail. While the Group 15 herbicides will not control emerged weeds they will provide residual weed control later into July and allow the soybean canopy to develop and shade out some of the emerging weeds. Make sure to read the herbicide label as different group 15 herbicides will have varying application cutoff dates based on crop stage and preharvest interval. Outlook (V5), Dual II Magnum (3rd trifoliate), Dual II Magnum (90 day PHI), Warrant (R2), Zidua (V3). Check label for details and rate limits. As you weigh these risks, keep in mind how severe of a weed or weed infestation you are targeting. Is it worth the risk to your crops yield potential to control a few more weeds? In some situations a field cultivation would provide better control, aerate the soil and enhance the rate of canopy closure, thus avoiding some of the postemergence herbicide risks discussed in this article. Finally, always remember that there are no good answers to rescue treatments as we leave June and enter July, just a weighing of risks and benefits. Good luck.